A tree is a hierarchical data structure which is used to store the data. A binary tree is made of nodes where each node has at most 2 references, a "left" reference and a "right" reference and a data element. The hierarchy starts with a top most element called the root node. The references directly under a node are called children and node is referred as parent. Tree/Binary tree is very commonly used data structure. Applications of tree can be found in search algorithms, distance measuring alorithms , genetics algorithms etc. 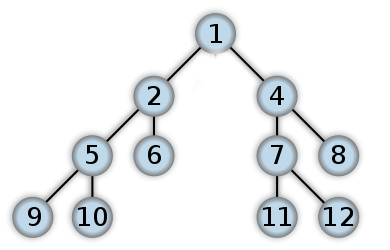 Another version of Binary tree, known as binary search tree provide better traversal that linkedlist. Traverse the left subtree by recursively calling the post-order function. Traverse the right subtree by recursively calling the post-order function. Display the data part of root element (or current element).